The Best Yoga Podcasts from thousands of Yoga Podcasts on the web using search and social metrics. Subscribe to these audio podcasts because they are actively working to educate, inspire, and empower their readers with frequent updates and high-quality episodes. Yoga Podcast newsletter is a comprehensive summary of the day's most important audio podcasts episodes from the best podcasters on the web, and delivered to your email inbox each morning. To subscribe, simply provide us with your email address. San Francisco, CA About Podcast A weekly yoga podcast that focuses on creating a happy, healthy, meaningful life. Topics are related to all things yoga: From how yoga creates self-awareness and good habits, to how it's being used in schools, to nitty gritty yoga anatomy advice, to the simple ways it helps us navigate emotions. Connecticut About Podcast Listen to this podcast where Candace an international yoga instructor shares yoga tips. Facebook fans 25,786. Twitter followers 4,143. About Podcast Candid conversations about yoga and beyond. From yoga philosophy, to the business of yoga, to subjects unrelated to yoga, J and his esteemed guests always have something interesting to say. Facebook fans 4,295. Twitter followers 2,135. Boston, MA About Podcast Josh Summers is a Yin Yoga teacher, licensed acupuncturist, and meditation instructor. He offers workshops, teacher training, and retreats around the world. The purpose of this podcast is to illuminate the theory and practice of Yin Yoga, Chinese Medicine, and meditation as three interwoven tools for apprehending the Everyday Sublime. Facebook fans 569. Twitter followers 297. About Podcast Each week, Lucas brings expert guests, nutritional research, and answers questions from listeners from around the world. From best-selling authors and medical doctors to yoga misfits and mind-body researchers, the show is always through-provoking and focused on helping you live a healthy and successful life. Facebook fans 319,520. Twitter followers n/a. Aruba About Podcast Rachel Brathen, known as Yoga Girl, is an international yoga teacher and speaker, bestselling author and serial entrepreneur who inspires millions every day. Weekly episodes of storytelling and talks from Rachel (sometimes alongside special guests!) dive into topics such as love, trust, finding balance, overcoming adversity and of course, yoga and well-being.The light you are seeking is within your own heart. Join Rachel as she helps you uncover it, from her heart to yours. Facebook fans 537,582. Twitter followers 39,911. London, UK About Podcast Listen to this free yoga podcast to support your home practice with short region-specific practices to full-length audio yoga classes recorded live in London.The classes focuses on feet, outer hips, quads and hip flexors, shoulders, core and more! Facebook fans 1,623. Twitter followers 963. About Podcast Listen to the Body Posi Yogi Podcast where two yogis talk about yoga, body positivity, spirituality, and intersectional feminism...all while popping' bottles of champagne and recording with our golden mics! About Podcast This podcast is an information, support, and inspiration for yoga teachers. Topics include the business of yoga, teaching skills, philosophy, ethical and legal considerations, and more. Owen Sound, Ontario About Podcast Listen to this podcast which helps yoga teachers to stay connected to information, entrepreneur advice and a community of supportive yoga teachers and professionals. Facebook fans 1,738. Twitter followers 93. About Podcast Bad Yogi Magazine Podcast provides online yoga classes for real people. Facebook fans 4,227. Twitter followers n/a. Dallas, TX About Podcast Yoga Digest is a vibrant community of passionate change-makers. We inspire, educate and connect through a shared desire to create optimal health and well-being for all. Listen to this podcast to get educated and inspired by yoga. Facebook fans 6,853. Twitter followers 435. About Podcast Yoga Chicago Podcast is a free resource guide for yoga activities. Our goal is to provide a forum to share information related to yoga and spirituality. Facebook fans 1,968. Twitter followers n/a. About Podcast The Yoga Health Coaching Podcast helps people find a coach and become a better yoga health coach. It also talks about ayurveda in depth. About Podcast For the Art, Science & Business of teaching yoga. We're here to offer yoga teachers a supportive environment to learn, grow & thrive. Facebook fans 1,317. Twitter followers 76. About Podcast M.B.Om is a podcast for yoga teachers interested in learning more about the business side of yoga. Facebook fans 732. Twitter followers 223. About Podcast The Flow Artists Podcast is a Podcast on Yoga, Meditation, Art, Technology. Join hosts Rane Bowen and Jo Stewart for in-depth conversations with some of the best yoga, meditation and movement teachers from Australia and around the world. Facebook fans 220. Twitter followers 519. About Podcast A weekly conversation for Yoga teachers and holistic practitioners who are looking to create abundant business. Through this podcast Amy McDonald shares systems and techniques that helps you grow your Yoga business. Facebook fans 6,436. Twitter followers 54. New jersey About Podcast Your Wellness Yogi Podcast is a place where Michael (Mukunda Chandra das) is dedicated to helping clients and students find balance in all aspects of their lives - emotionally, mentally and physically. Facebook fans 444. Twitter followers 62. San Francisco About Podcast Listen to this podcast where Danni Pomplun a 500-hr Registered Yoga Instructor, and a member of the teacher training faculty at Yoga Tree shares his passion for yoga. Facebook fans 2,712. Twitter followers 1,509. Los Angeles About Podcast Icewater Yoga Podcast is a podcast for the conscious Athletes. Facebook fans 141. Twitter followers 6. San Diego, California About Podcast A podcast about yoga teaching, business, and just folks getting real!! The content on this podcast will give you an idea of what its like to be a yoga teacher and possibly inspire you to take the step towards teaching yoga yourself or taking your already yoga teaching job to new heights. It will most certainly give you a deeper understanding of what a yoga teacher does to maintain a flow of goodness and groceries. Facebook fans 173. Twitter followers 192. About Podcast Listen to this podcast where Anna Skleba and Katie O'Shaughnessy shares everthing related to yoga. santa rosa, ca About Podcast Listen to this podcast which teaches yoga that meets you where you are, whatever your experience level or goals. Facebook fans 1,581. Twitter followers 238. Los Angeles, CA About Podcast From basics to strong, 45 to 90 minutes, you can find the yoga class you want in this free podcast. Recorded live during his classes in Los Angeles, Nathan Johnson fuses Vinyasa Flow with key alignment principles in a practice that is challenging for the body and spirit. Facebook fans 506. Twitter followers 183. About Podcast Listen to Smart and Practical resources for yoga teachers and students from the mind of kathryn anne flynn, yoga and meditation teacher. About Podcast Attracting Yoga combines meditation and yoga sequences with law of attraction practices. Connect to your higher self to reach your goals. 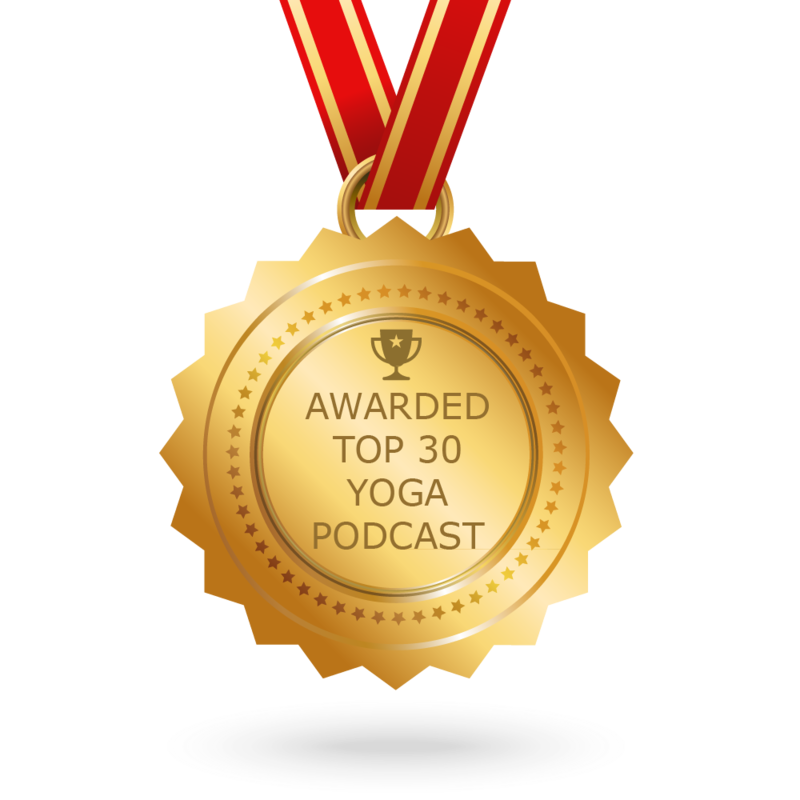 CONGRATULATIONS to every podcast that has made this Top Yoga Podcasts list! This is the most comprehensive list of best Yoga Podcasts on the internet and I’m honoured to have you as part of this! I personally give you a high-five and want to thank you for your contribution to this world.